Did you miss the Duquesne Day of Giving, but still want to make a gift to Duquesne? You can make a gift at this link. Shea Hoffmann Murtaugh A'94 and James Murtaugh B'93 will match The Duquesne Fund donations dollar-for-dollar, up to $1,000. A group of anonymous School of Nursing alumnae will match donations to the Alice C. Feehan Fund dollar-for-dollar, up to $1,000! This fund provides emergency funding to Duquesne University School of Nursing students. Kevin McQuillan B’87 and Principal at The McQuillan Group along with his wife Amanda McQuillan A’92 GA’94 will match donations to the Biomedical Engineering program dollar-for-dollar, up to $1,500. Jonathan Dorph (Class of 2014), Alex Federinko (Class of 2011) and PJ Blinn (Class of 2014) will match all Cross Country and Track and Field donations dollar-for-dollar, up to $1,500. Members of the A10 XC Championship Team will then match the next $1,500 of donations dollar-for-dollar. William Murphy, A'52 will match donations to the Duquesne Media department (formerly known as the Journalism and Multimedia Arts Department) dollar-for-dollar, up to $2,000. Duquesne Media is home to majors in Digital Media Arts, Multiplatform Journalism, Sports Information and Media, and Strategic Public Relations and Advertising. An anonymous Duquesne University faculty member will match donations to the Duquesne University Scholarship Association (DUSA) dollar-for-dollar, up to $1,000! Fr. Sean Hogan is President of the DUSA. An anonymous football alumnus has made a $15,000 matching gift challenge to benefit the 2018 NEC Champion Football program. All donations on the Day of Giving to the Football program, will be matched dollar-for-dollar, up to $15,000. This Matching Gift is in honor of Coaches Terry Russell and John Stefanik who had such a positive influence on his life during his playing days at Duquesne and he remains excited and committed to the continued growth of the Football program under the leadership of Head Coach Jerry Schmitt. The Gumberg Library Leadership Team will match donations to Gumberg Library dollar-for-dollar, up to $1,000. William F. Goodrich, Esq., A'74, L'79, of Goodrich & Geist, PC, will match donations to the Ice Hockey team dollar-for-dollar, up to $1,000! Si Bishop, '10, a Duquesne Hockey alumnus, will donate $500 to the Duquense University Ice Hockey team if 50 gifts are made to the program, $750 of 75 gifts are made, and a total of $1,000 if 100 individual gifts are made. If 50 individuals donate to the McAnulty College and Graduate School of Liberal Arts the College's Advisory Board will donate $3,000; an additional $3,000 if 100 individuals donate; an additional $3,200 if 150 individuals donate; and Dean James Swindal and his wife Mary, will donate $3,000 if 200 individuals donate to the College – for a combined participation Challenge total of $12,200. Catherine Hammond A'65 will match donations to the Department of Modern Languages and Literatures dollar-for-dollar, up to $1,250. Dr. Chris Daly, a former John G. Rangos, Sr. School of Health Sciences faculty member, will match donations to the Department of Physician Assistant Studies dollar-for-dollar, up to $2,000! If 50 individuals donate to the Duquesne School of Law the Duquesne Law Alumni Association (DLAA) will donate $2,500; an additional $2,500 if 75 individuals donate; and Paul J. Gitnik, A’81 L’85 will personally donate $2,500 if 100 individuals donate! Francis Feld, N'93 will match donations to the School of Nursing dollar-for-dollar, up to $3,500! Heritage Valley Health System will donate $1,000 if 120 individuals make a donation to the School of Nursing. Craig G. Cochenour, P'81, L'88 ($1,000) and Barbara Putignano, P'86 ($1,000) will match School of Pharmacy donations dollar-for-dollar up to a combined total of $2,000. Randal McCarthy, P’88 will match donations to the Sean M. Hogan, C.S.Sp. Endowed Scholarship Fund dollar-for-dollar, up to $2,000. An anonymous supporter and parent of a Duquesne University women's swimming alumna has made a $10,000 matching gift challenge to benefit the 2018 A10 Champion Swimming and Diving program. All donations on the Day of Giving to the Swimming & Diving program, will be matched dollar-for-dollar, up to $10,000. An anonymous family of a Duquesne University Women's Lacrosse team member will match dollar-for-dollar the first $1,500 in gifts to the Women's Lacrosse team. An anonymous Women’s Soccer supporter will match donations to the women’s soccer team, dollar-for-dollar, up to $1,000! 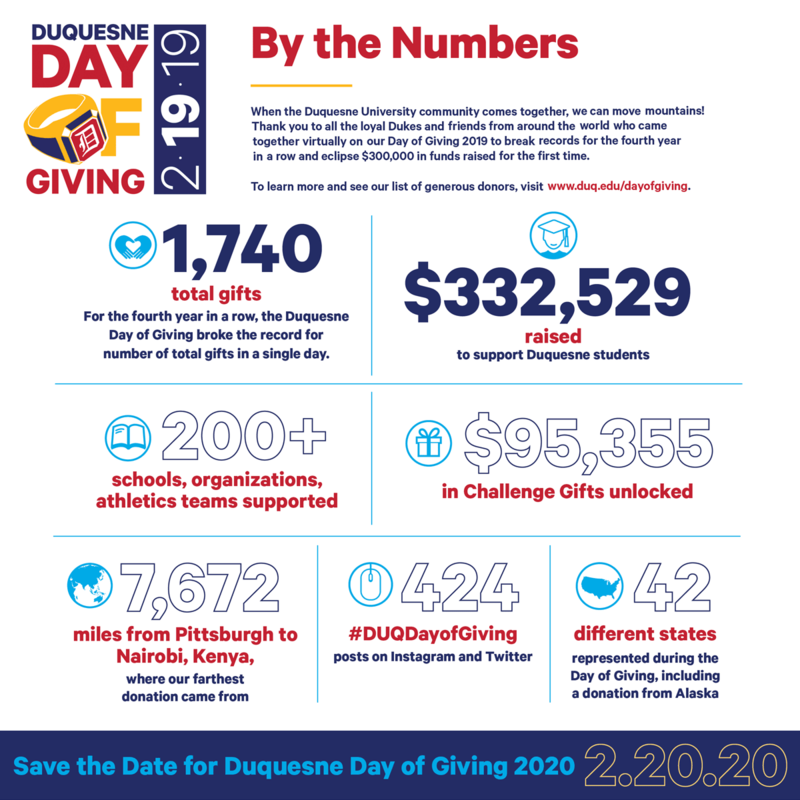 Which Athletics team will raise the most money for their team during the Duquesne Day of Giving? Which Greek Life organization will raise the most money for their organization during the Duquesne Day of Giving?